Shut your eyes. Imagine lazing in a steamy private hot pool with someone special at New Zealand’s top thermal pool resort – Hanmer Springs. The sun is setting over the picture postcard snow-capped mountains. Not a sound can be heard but the occasional bellbird call. It feels so romantic. But there are more these days to Hanmer than just the busiest hot pools in New Zealand. The number of adventure activities is growing but it finally has some outstanding restaurants and some really brilliant top end boutique fashion shops – such as Rohm and Mhor. Hanmer is becoming like a mini-Queenstown for people wanting one of the best short holiday bases in New Zealand. The recent opening of Chantellinis restaurant in a charming historic 1930s home is the icing on the cuisine cake for visitors to Hanmer. The restaurant’s oozes charm and character and the food is up with the best in the country. We set up base in Cheltenham House which was built 75 years ago. Current owners and wonderful hosts Len and Maree renovated the place and opened it for guests in 1996. Our Windsor suit was so warming, quiet and sunny and at a very fair rate of $255 including evening wines in the grand billiard room and breakfast served in our own suite. Len's eggs Benedict were divine. The billiard table was built in 1900 and the room was purpose built for the table when the house was built. I agreed with Lonely Planet and Rough Guide to NZ that Cheltenham is superb and the best B and B in town. New Zealand is famous for its bays, beaches, brilliant snow slopes and beautiful scenery. But this tiny thermal pool resort town 90 minutes north of Christchurch International Airport, is a slice of NZ paradise that is fast becoming a hugely popular tourist area. 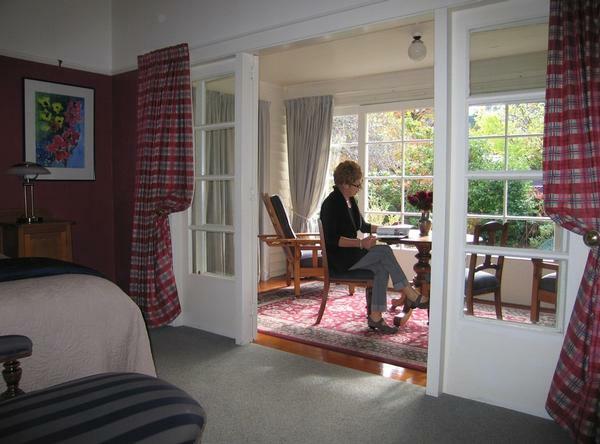 It’s also growing more rapidly as a place to retire – especially for Christchurch people after the earthquakes. I am in heaven in Hanmer; sprawled out in our hotel suite, feet up, bathed in sunshine sipping a buttery Spy Valley chardonnay. Before sunset we stroll the grounds of the old Queen Mary Hospital, which used to be a retreat for recovering alcoholics and ironically now across the road are several popular pubs! Under cover of darkness we make a bee-line for the thermal hot pools where more than 540,000 people soak their aches and pains and romantically relax. She is in her tiny fetching bikini and we are cuddled up in a quiet private little hot pool while the more energetic ones fly down the new fun hydro slides. We saunter back to Cheltenham and snuggle up in bed, in paradise. After our hearty home-made breakfast we walk to the summit of famous fir-clad Conical Hill for a breath-taking view over-looking the town. Leafy Hanmer – hot in summer and snowy in winter - is a resort for families, for lovers, for romantic weekends and a place to unwind. For the more energetic, try bungy jumping, mountain-biking, jet boating, horse trekking, skiing, snowboarding, quad biking through forests, rafting, golf and fishing. Mini-golf was as adventurous as we got.